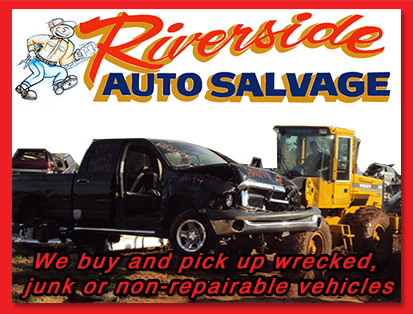 Riverside Auto & Truck Salvage takes pride in offering quality used auto parts. Parts are considered to be in good working condition and will be replaced, repaired or purchase price refunded (if another part is not in stock) if parts are found to be defective within 90 days of invoice date. If within 90 days of purchase a mechanical part proves to be defective, seller will, within a reasonable period of time replace the part. Original invoice must accompany any warranted part, no refunds without the original invoice. KEEP YOUR RECEIPT! 25% restocking fee if seller allows a non warranty return. Buyer is responsible for determining suitability and condition for purchase intended. Warranty on engines pertains to the block and head assembly. No warranty on seals, gaskets, pumps or timing components. Warranty covers knocks, smoke and excessive oil burn (more than 2 quarts per 3000 miles). Warranty is void if over heating or abuse has occurred. Sellers Descretion. Riverside Auto & Truck Salvage or any representative will not be liable for any labor costs of a defective part. Parts are used and can have defects not for seen by this company. No Cash Refunds on parts in stock. A store credit is available to customers who prefer in store credit as opposed to another part.